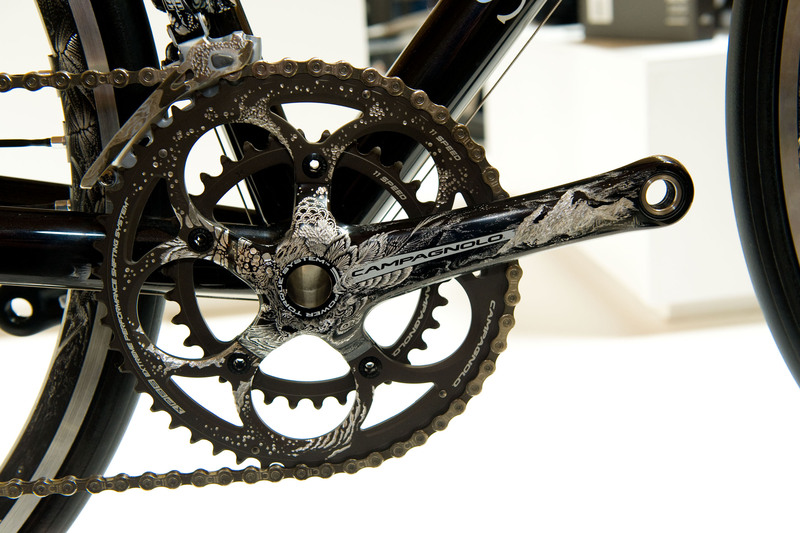 The creations on show at Bespoked, the UK Handmade Bicycle Show, in Bristol are enough to make your jaw-drop. From exquisite frames and custom bike builds to unusual components and downright wacky contraptions, the three-day show at Brunel’s Old Station and the Arnolfini Gallery showcases the very best in bespoke builds from the UK and across the world. 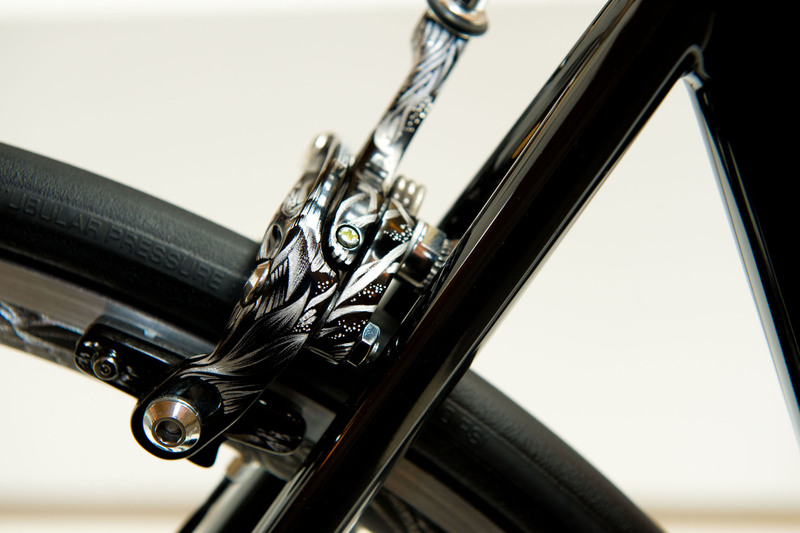 While undoubtedly things of beauty, these bikes aren’t just there to be gawped at. Each is designed to fulfill a purpose: to be ridden, to be enjoyed, and to put a smile on your face. 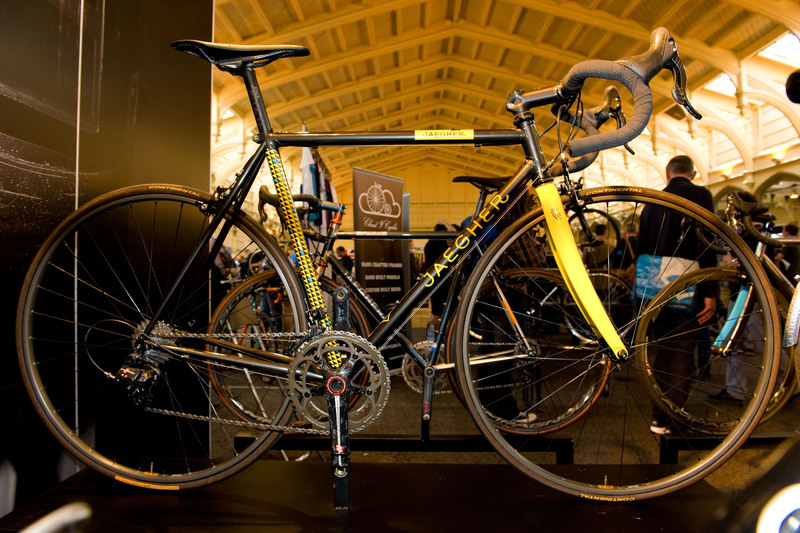 Cycling Weekly went along to Bristol and picked out some of the very best bikes on show. Matthew Sowter at Saffron Bikes collaborated with a Japanese artist called Kosuke Masuda to create a spectacular and unique bike. Floral, organic and zoological patterns have been etched into the black alloy Campagnolo Athena components and Shamal wheels before being matched with a hand-built steel frame. “He’s a Buddhist monk and so not surprisingly much of his art is abstract,” said Sowter, who began frame building after suffering from chronic fatigue syndrome in a previous job. 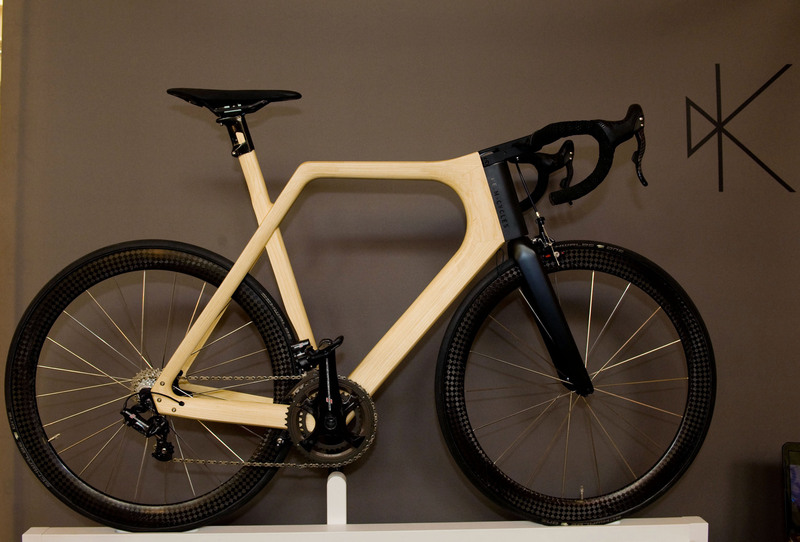 A prototype furniture designer by trade, Till Breitfuss has created an elegant wooden road bike that he claims rides better than carbon fibre. Using white ash forested from close to the company premises near the French city of Tours, around 150 thin pieces of wood are vacuum bonded together into two semi-monocoques before being hollowed out and stuck together. 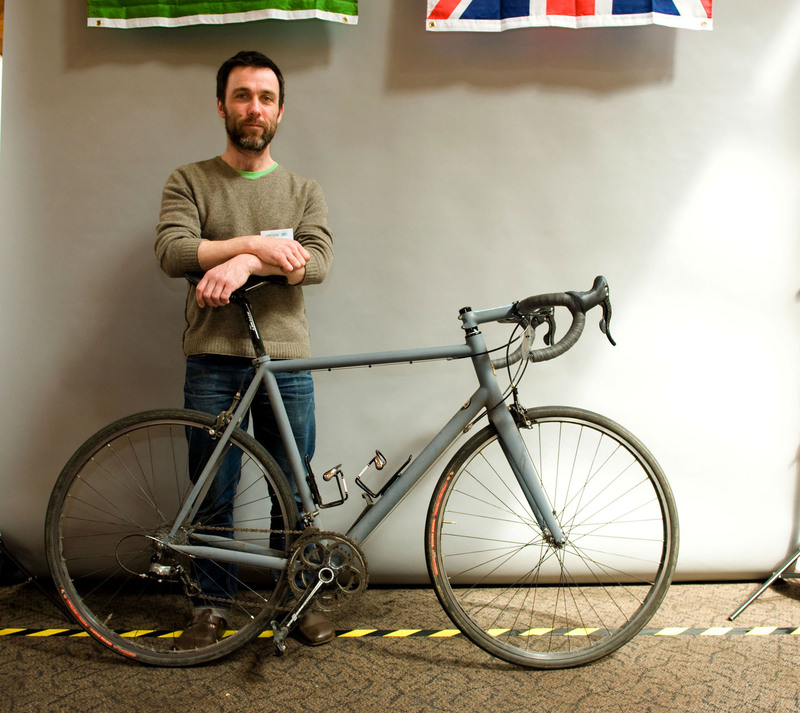 It’s not just the pros that get special bikes for Paris-Roubaix; Bristol based bike builder Robin Mather was commissioned to build a bike especially for the Paris-Roubaix cyclo-sportive. Fresh from conquering the cobbles last weekend, his subtle creation was fitted with 28mm tyres, short-reach brake calipers and Cervelo carbon forks and was displayed with a fine splattering of French mud. 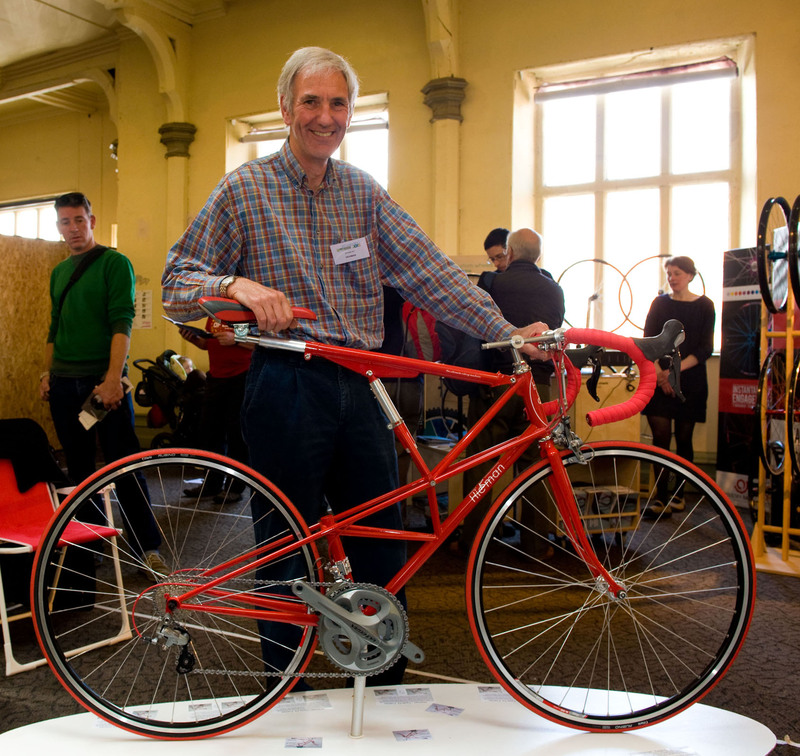 What started out as an idea for a bike with suspension morphed into a fully adjustable road bike with a saddle and handlebars that are adjustable in two dimensions – for reach and height – thanks to a unique spaceframe design and joints. Lots and lots of joints. 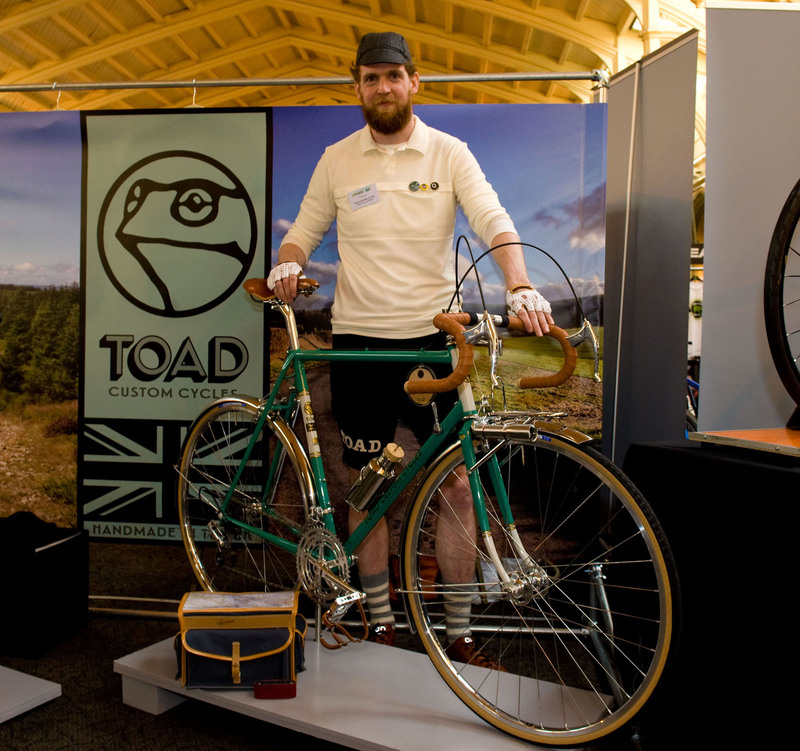 Toby Gallagher at Toad made himself this bike to ride at the Eroica Britannia vintage ride in the Peak District this summer. Having seen that the rules allowed new builds as long as they mirrored vintage machines, Gallagher took his cues from the Rene Herse touring bikes from the 1960s. The result is a gorgeous yet modern looking machine. But what’s behind the name? Where else in the world would a government commission a frame builder to build a bike to represent the region but in Flanders? Painted in yellow and black like the Flanders flag, the forks feature an updated Flanders lion while the triangle motif on the seat-tube will be familiar to Flandrians as the official pattern used on government communications, including tax returns. Jaegher used to make frames for the stars, with Eddy Merckx and Sean Kelly both riding frames from this small Belgian manufacturer during their careers. With a node to the Flemish pave, the Phantom frame has a classic geometry and is fitted with Ambrosio box rims laced to Campagnolo Record hubs. “Steel is still the best on the cobbles,” assures its maker Steve Vaneenooghe, who has followed his father and grandfather into frame-building for Jaegher.